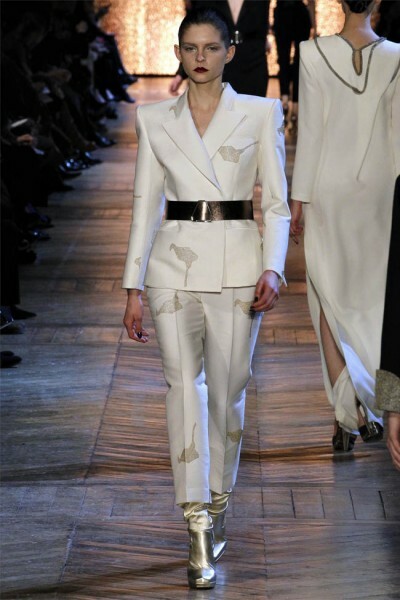 Yves Saint Laurent's Fall/Winter 2012 Runway collection is the last Stefano Pilati will ever produce under the house. Saturated with bold, highly structural shapes in true YSL glory; Pilati presented his farewell show with black, oily leather, chain mail gowns, and exaggerated, shapely shoulders (both rounded and squared) to his powerful pantsuits and jackets. Adding an almost militant feel to the collection, Pilati's shapes are harsh, cold, and impeccably constructed in mostly leather. The clean lines and sharp features are a celebration, and dare I say, exaggeration of the timeless Yves Saint Laurent woman. At the forefront of the fashion house since 2004, Pilati's contribution to the YSL line will not be forgotten, nor can it be necessarily replaced, respectively. I am excited to see who will take place of Pilati as the head of the house of Yves Saint Laurent, although, in all honestly, I wish it was me!